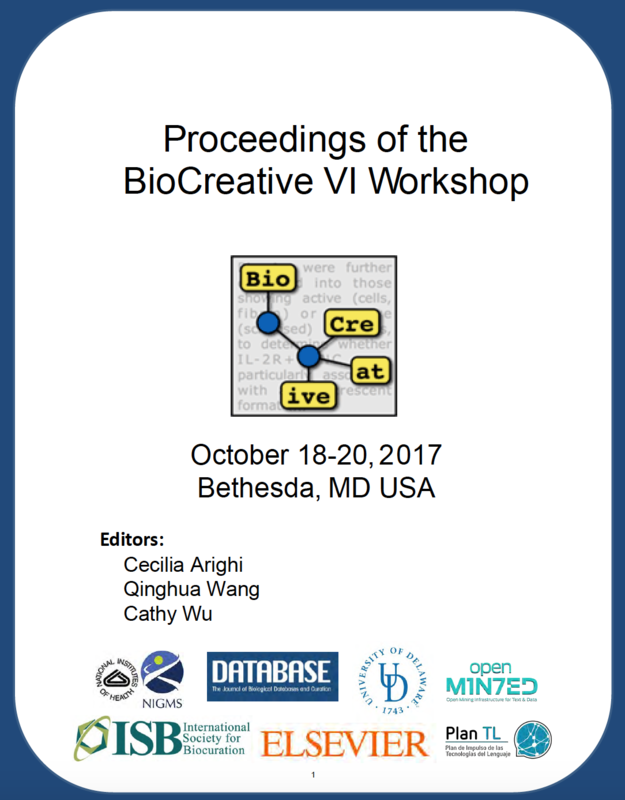 The BioCreative VI workshop will be held at DoubleTree by Hilton Hotel Bethesda - Bethesda, Maryland during October 18-20, 2017. 11:30-11:40 Johanna McEntyre, EMBL-EBI- How can text mining scale to meet diverse and precise curation needs? Submission of abstracts/papers should be done via Easychair at the following URL: https://easychair.org/conferences/?conf=bc6. Format for submission:PDF. BioCreative VI proceedings will be published online and will be available at the time of the meeting. We will invite selected works for full publication in the Database Journal Special Issue for BioCreative. Track presentation submissions: Track participants should submit their work in the form of a short paper (up to 4 pages). See template with instructions here. Although template is a word document, the format for submission should be in PDF. General session submissions: BioCreative VI will host a general session to provide an opportunity to discuss related work to BioCreative topics, including data set preparation, evaluation, biomedical information extraction. Then, we are soliciting submission of your bioNLP work that is related to any of these topics in the form of a 2 page abstracts (see template with instructions can be found here). Although template is a word document, the format for submission should be in PDF. Abstracts will be selected for oral presentation during the corresponding session. There are a number of rooms reserved for this event at the DoubleTree hotel with a special rate of US$219 per night. This special rate is available through September 22, 2017. Guests can call 1-800-955-7359 and request the group rate for the BioCreative VI Conference or the Group SRP/Code: BC0. Go to the hotel main page www.bethesda.doubletree.com, click on the Reservations Tab, enter dates and on the Special Accounts Section enter BC0 for the Group/Convention Code. The special rate applies for the nights 10/17/2017 through 10/20/2017. The Doubletree Hotel in Bethesda is conveniently located near 3 airports. It is just 15 miles from Ronald Reagan Washington National Airport (DCA), 27 miles from Washington Dulles International Airport (IAD), and 38 miles from Baltimore Washington International Airport (BWI). All three airports should have private shuttle services available. Fees for these services vary based on distance to the hotel. You are responsible to inquire about visa requirements to enter the US. General information about US visas can be found here. If you need a letter of invitation to attend the workshop please send email to ﻿bcviworkshop@gmail.com with subject: visa letter request﻿.